The Start Stop function on my 2016 Trailhawk has been a nuisance to me and for many others, least of which is the wear it puts on battery and starter. Yesterday and fortunately, in my driveway, my battery of less than 30 months died and I was thinking since the day I got my Jeep, things like this would happen because of repeated starts. I searched online and found various fixes from a $129.00 OBD module that plugs into the diagnostic socket and re-programs the cars CPU, to a few other fixes, some permanent and some temporary. What I found most interesting and surprising was that I could basically eliminate the Start Stop function rather easily, albeit not 100%, but in most cases pretty much totally. I found while exploring in detail all the controls located on the Jeeps Uconnect screen, a window and controls I've never seen. Last edited by Gatoraied; 06-10-2018 at 10:18 AM. I don't know if this will help as I have 2019 Cherokee Trailhawk. 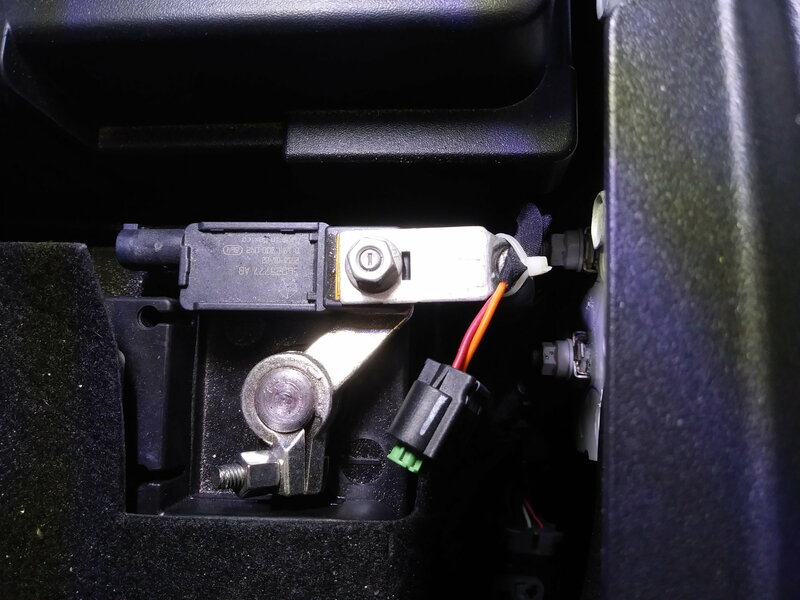 I disabled the Stop Start feature by disconnecting the cable that is connected to the current sensor connected at the negative terminal of the battery. I believe the sensor monitors the current draw from the battery when the engine shuts down and if it's too high the engine will keep running. I get a brief warning that the Stop Start need to be serviced every time I start and a continuous small orange "A!" just above the fuel gage. I have been running like this for several months with no ill effects. Hope this helps. How much MPG loss have you experienced from stopting the stop start? I did not do a before and after test, my main reason for disabling the stop start function was to save wear on the starter and battery. does the KL not have a separate 48 volt battery for the stop/start function? i know my JL does. but i got a 6 speed stick, so it only shuts off if i put the jeep in neutral and take my foot off the clutch. then as soon as i press the clutch back in, the engine will start. i also have a button on the dash so i can disable it upon start up, but need to do it every time. i just leave it in gear with my foot on the clutch at a light, and it won't shut off. i'm thinking maybe you could disconnect the 48 volt battery to disable the stop/start function. my 48 volt battery is underneath my main battery, it's about the size of a motorcycle battery. The cable is shown removed from the black module connected to the negative battery terminal. There is a quick release that you must press on the cable to pull it out of the module. I just got a new 2019 latittude plus with the V6 ( the VVT is really important ) and 4X4. It has a button labeled "A". That button turns off the start stop. You have to press it every time you start the car. Seems easy enough. I don't know if the other models have this. I use the button every time I start the car. I can see there may be times I want it to use the start stop, like if traffic is stopped for a long time. Actually I don't see much use for it, because you have to keep your foot on the brake for it to use the start stop. I think it's supposed to save about 3% on fuel. So for $100 worth of fuel you can save $3.00 while wearing out your starter and battery. I think they did it to make the environmental people happy but it is a really stupid idea. Using the button is easy enough so I don't think there is a reason to make other modifications. Last edited by travistee; 04-02-2019 at 08:16 PM. You are correct . THe VVT has nothing to do with this start stop issue. But, I like it. It has something to do with the efficiency of the engine, like start-stop. OK, so I like it but it's not important. It has something to do with the efficiency of the engine. ...I think it's supposed to save about 3% on fuel. So for $100 worth of fuel you can save $3.00 while wearing out your starter and battery. Any fuel savings from ESS depends on how you drive - it saves nothing during highway driving for example. Data suggests it saves 1-2 mpg during “city driving”. There is no evidence it “wears out” the starter, many manufacturers use a similar system. It is hardly a “stupid idea”, FCA paid $77 million dollars in fines last year because they didn’t meet CAFE requirements. The ESS reduces the CAFE, so it saves FCA a lot of $$$. Definitely not “stupid”. It isn’t about you. This video doesn't have anything good to say about start stop.